The Melbourne International Flower and Garden Show has been held each year for over 20 years. And each year we like to bring you a few images of landscaping displays, plants and garden accessories that caught our eye. In 2016 we found some great garden design ideas, some new release plants, a few old favourites, some brilliant bird baths and a unique system for growing vegetables. Being Mellbournian’s ourselves, we are very familiar the laneways and alleys of the older suburbs of the city. The installation by Daniel Tyrrell Landscapes aptly titled ‘Right of Way’ brought back memories of laneways and ‘Right of Ways’ as we used to call them. 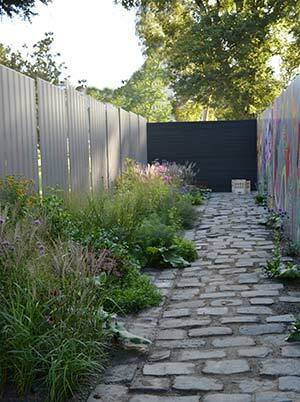 The ‘Laneway’ has been repurposed in this installation to create a ‘secret garden’. The concept of greening our suburbs, providing space for growing herbs and vegetables and generally making our environment a little more attractive and productive is reinforced by this clever design. The use of water, reflective surfaces and mass plantings in a cottage garden style is so effective in this landscape design it impressed many. The question was asked by a small girl, ‘Mum can we do that to our Backyard?’ Mum answered, ‘If we had the room’. And as this installation backed onto a lake in the garden it may seem out of reach to many. It is however the combination of plants, pathways, water and mirrored surfaces that works so well. 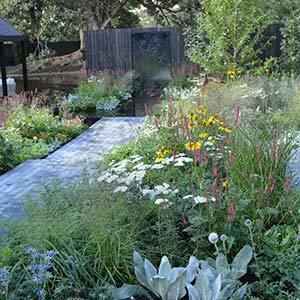 As with so many landscape designs, it’s the general idea, combined with some of the small details that are transferable. So yes you can have this in your backyard, simply scale it to a size that fits. We have to admit that we love plants that are a little different, especially bulbs. Also known as the ‘Copper Rain Lily’, Habranthus andersonii is not a bulb you will find in many nurseries, however Shirley and Jane are offering for sale at the time of writing. Excellent in a rock garden or grown in a container. They were also offering Fritillaria Imperialis, very rarely offered. And Jane has worked out how to grow these, ask her for instructions. 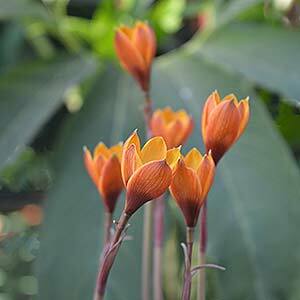 A third bulb they were offering is Lycoris aurea, also known as the ‘Golden Spider Lily’. Brilliant yellow flowers in an autumn flowering bulb.